Recent advances in isolating epithelial progenitor cells and stromal cells, as well as defining niche factors important for lung development, have led to the establishment of an in vitro 3D lung culture system: pulmonary (lung) organoids. Below is a collection of resources to support your pulmonary research. This Technical Bulletin reviews the importance of how cultures of primary human airway (nasal, tracheal and bronchial regions) epithelial cells are instrumental in studying basic and applied aspects of airway biology, disease and therapy. To appropriately model the in vivo human lung, specialized in vitro cell culture techniques have been developed that promote the formation of 3D structures recapitulating the morphological and functional characteristics of the airway. Special culture techniques are required for stem and progenitor cells isolated from different regions of the lung. For example, basal cells from the proximal human airway, upon recapitulation in organotypic air liquid-interface (ALI) culture, differentiate into a mucociliary pseudostratified epithelium containing ciliated, goblet and basal cells. 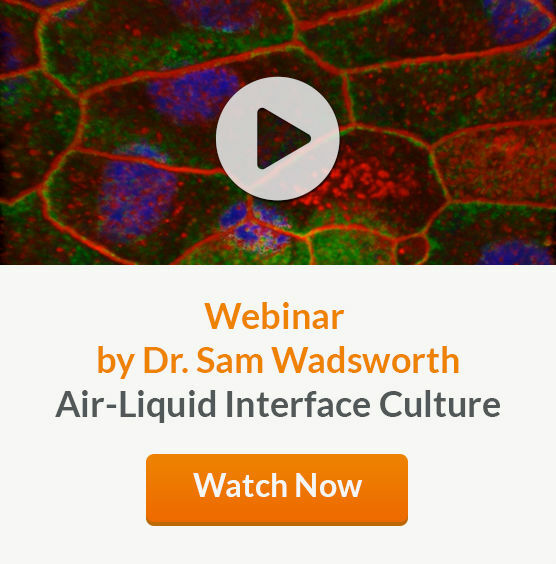 In this in vitro cell culture environment, cells display beating cilia, mucus secretion, barrier properties, as well as remodeling and restoration properties similar to the native airway epithelium. 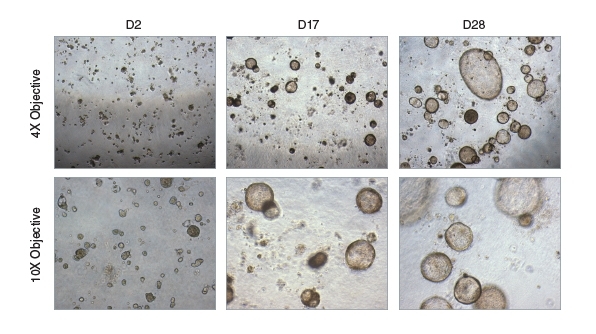 This ALI culture is the most well-characterized model in the in vitro lung modeling field.13–15 In this method, the human bronchial epithelial cells obtained from bronchial brushings, or through isolation of epithelial cells from cadaveric donor tissue, can be seeded on permeable inserts. The procedure for inducing cell differentiation first requires growth of the cells in submerged cultures on inserts until they become fully confluent. Next, medium is removed from the apical surface and cultures are grown in ALI conditions and cultured until they have become fully differentiated, a process that takes 21 - 28 days. Once ‘airlifted’, ALI cultures are fed with medium bathing the basolateral cell surface only. The combination of apical exposure to air and basal exposure to specialized cell culture medium triggers differentiation of the monolayer culture to a pseudo-stratified columnar epithelium that resembles the native human airway. This model system is useful in a number of applications ranging from in vivo inhalation toxicology and drug-screening to basic research. The advantages of this model over in vivo animal studies include the use of human tissue, a relatively low cost of maintenance and ease of handling. The use of ALI cultures also offers a unique opportunity for the direct deposition of aerosol particles onto semi-dry apical cell surfaces, a procedure that mimics the deposition of powders onto the airway surface.16–18 The drawback of ALI culture is its limitation for use in high throughput scales. Additionally, even though this ALI culture works well for proximal airway, it doesn’t work for distal airway, likely due to a higher complexity of the alveolar stem cell niche and the requirement of stromal cell support for the alveolar structure. Moreover, epithelial cells grown in ALI culture are not passageable. Recent progress in isolating epithelial progenitor cells and stromal cells, and defining niche factors important for lung development, has led to the establishment of an in vitro 3D lung culture system: pulmonary (lung) organoids.12,19 In pulmonary organoid cultures, epithelial stem and progenitor cells are cultured in ECM supplemented with either a mixture of growth factors or stromal cells. The organoids then self-organize into complex structures retaining clusters of multi-lineage epithelial cells. Pulmonary organoids recapitulate various features of the lung including heterogeneous cell composition, spatial organization, and retention of a stem cell population harboring the capacity to both self-renew and differentiate. In pulmonary organoid culture, isolated airway epithelial cells can be grown as 3D spheres in semi-solid Matrigel® ECM with or without the use of tissue culture inserts. Individual cells are able to grow into clonal spheres called bronchospheres, bronchioalveolar spheres or alveolospheres, depending on the origin of the starting cells. While bronchospheres can be formed in specialized matrices and medium without co-culture with other tissues,9,20 bronchioalveolar spheres and alveolospheres can currently only be formed in co-culture with other cell types, such as fibroblasts or endothelial cells, thus requiring a more advanced culture system, called organoid co-culture.12,19 Recently, several groups demonstrated that the pulmonary organoids can be generated from human pluripotent stem cells following a stepwise directed differentiation.21–23 The advantages of the pulmonary organoid co-culture are propagation ability, amenability for high throughput screening, and feasibility of establishing a distal lung model. The most attractive advantages of pulmonary organoid cultures is that they allow for the expansion of lung stem cell populations and the induction of differentiated cells from very limited amounts of starting material. In addition, it provides a more physiologically relevant culture system, particularly for the distal lung. These special characteristics make organoid culture an excellent culture system for a wide range of applications in both basic and translational approaches such as drug screening, disease modeling and genetic screening. Pre-clinical models of human disease are essential for the basic understanding of disease pathology and its translational application into efficient treatment for patients. Patient-derived organoid cultures from biopsies and/or surgical resections present a novel improvement to this end and disease modeling will likely be a primary focus of future organoid studies. Two examples are lung cancer and cystic fibrosis.28 Adult primary epithelial cell-derived organoids combined with CRISPR/Cas9-mediated genetic engineering technology may allow conversion of normal organoids into their respective malignancies in vitro by adding a combination of cancerous mutations in a sequential manner.29,30 This system is not only able to recapitulate human lung cancer but also to further assess responses to combination drug therapy. Recently, patient-derived organoids from human lung cancer biopsies have been established and have enabled the analysis of resistance mechanisms for targeted therapies in individual patients.31 The ability to rapidly generate organoids from individual patients also enables biobanking, testing of chemotherapies for personalized medicine development and targeted therapies. Using pulmonary organoids, we can investigate the function of lung stem cells residing in distinct regions of lung tissue while also monitoring their behaviour in different micro-environments. Although pulmonary organoid culture systems are still in their infancy, it is becoming possible to extend their use to biomedical applications such as disease modelling and treatment. Generation of patient-derived organoids from biopsies provide a powerful resource for a wide range of translational and medical approaches, such as drug toxicity and efficacy studies. Some issues for the current pulmonary organoid culture technique are still unresolved, such as culture conditions to better maintain genetic stability and physiological function over time and development of organoid high-throughput screening platforms. Addressing these technical difficulties will advance the technology rapidly toward pre-clinical and clinical applications. Konar D et al. (2016) Lung-On-A-Chip Technologies for Disease Modeling and Drug Development Biomed Eng Comput Biol 7(Suppl 1): 17–27. Choi J et al. (2016) Organogenesis of adult lung in a dish: Differentiation, disease and therapy Dev Biol 420(2): 278–286. BéruBé K et al. (2009) In vitro models of inhalation toxicity and disease. The report of a FRAME workshop Altern Lab Anim 37(1): 89–141. Crystal RG et al. (2008) Airway Epithelial Cells: Current Concepts and Challenges Proc Am Thorac Soc 5(7): 772–777. Kaisani A et al. (2014) Branching morphogenesis of immortalized human bronchial epithelial cells in three-dimensional culture Differentiation 87(3–4): 119–26. Bowden DH. (1983) Cell turnover in the lung Am Rev Respir Dis 128(2 Pt 2): S46-8. Goss RJ. (1966) Hypertrophy versus hyperplasia Science 153(3744): 1615–20. Kotton DN & Morrisey EE. (2014) Lung regeneration: mechanisms, applications and emerging stem cell populations Nat Med 20(8): 822–32. Rock JR et al. (2009) Basal cells as stem cells of the mouse trachea and human airway epithelium Proc Natl Acad Sci U S A 106(31): 12771–5. Lee J-H et al. (2014a) Lung stem cell differentiation in mice directed by endothelial cells via a BMP4-NFATc1-thrombospondin-1 axis Cell 156(3): 440–55. Rawlins EL et al. (2007) Lung development and repair: Contribution of the ciliated lineage Proc Natl Acad Sci 104(2): 410–417. Barkauskas CE et al. (2013) Type 2 alveolar cells are stem cells in adult lung J Clin Invest 123(7): 3025–3036. Whitcutt MJ et al. (1988) A biphasic chamber system for maintaining polarity of differentiation of cultured respiratory tract epithelial cells In Vitro Cell Dev Biol 24(5): 420–8. Neuberger T et al. (2011) Use of Primary Cultures of Human Bronchial Epithelial Cells Isolated from Cystic Fibrosis Patients for the Pre-clinical Testing of CFTR Modulators In Methods in molecular biology (Clifton, N). pp. 39–54. Randell SH et al. (2011) Primary Epithelial Cell Models for Cystic Fibrosis Research In Methods in molecular biology (Clifton, N). pp. 285–310. Wong AP et al. (2012) Directed differentiation of human pluripotent stem cells into mature airway epithelia expressing functional CFTR protein Nat Biotechnol 30(9): 876–82. Kastner PE et al. (2013) A dynamic system for single and repeated exposure of airway epithelial cells to gaseous pollutants Toxicol In Vitro 27(2): 632–40. Mathis C et al. (2013) Human bronchial epithelial cells exposed in vitro to cigarette smoke at the air-liquid interface resemble bronchial epithelium from human smokers Am J Physiol Lung Cell Mol Physiol 304(7): L489-503. Lee J-H et al. (2014a) Lung stem cell differentiation in mice directed by endothelial cells via a BMP4-NFATc1-thrombospondin-1 axis Cell 156(4): 440–55. Danahay H et al. (2015) Notch2 is required for inflammatory cytokine-driven goblet cell metaplasia in the lung Cell Rep 10(2): 239–52. Dye BR et al. (2016) How to Grow a Lung: Applying Principles of Developmental Biology to Generate Lung Lineages from Human Pluripotent Stem Cells Curr Pathobiol Rep 4(2): 47–57. Konishi S et al. (2016) Directed Induction of Functional Multi-ciliated Cells in Proximal Airway Epithelial Spheroids from Human Pluripotent Stem Cells Stem cell reports 6(1): 18–25. Tadokoro T et al. (2014) IL-6/STAT3 promotes regeneration of airway ciliated cells from basal stem cells Proc Natl Acad Sci U S A 111(35): E3641-9. Jain R et al. (2015) Plasticity of Hopx(+) type I alveolar cells to regenerate type II cells in the lung Nat Commun 6: 6727. Frank DB et al. (2016) Emergence of a Wave of Wnt Signaling that Regulates Lung Alveologenesis by Controlling Epithelial Self-Renewal and Differentiation Cell Rep 17(9): 2312–2325. Levy BD & Serhan CN. (2014) Resolution of acute inflammation in the lung Annu Rev Physiol 76(1): 467–92. Mou H et al. (2015) Personalized medicine for cystic fibrosis: establishing human model systems Pediatr Pulmonol (S40): S14-23. Arai D et al. (2015) Characterization of the cell of origin and propagation potential of the fibroblast growth factor 9-induced mouse model of lung adenocarcinoma J Pathol 235(4): 593–605. Sun L et al. (2016) Tumor endothelial cells promote metastasis and cancer stem cell-like phenotype through elevated Epiregulin in esophageal cancer Am J Cancer Res 6(10): 2277–2288. Kimura M et al. (2015) Analysis of ERBB Ligand-Induced Resistance Mechanism to Crizotinib by Primary Culture of Lung Adenocarcinoma with EML4-ALK Fusion Gene J Thorac Oncol 10(3): 527–530.